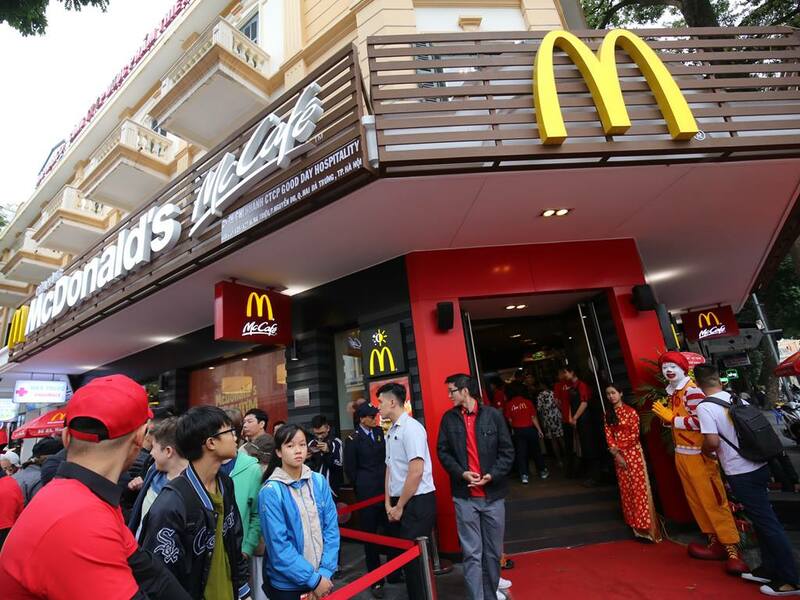 Last Saturday, McDonald’s opens its very first restaurant just near by Hoan Kiem Lake, the center and historic place of Hanoi. Long lines of customers, mostly are Vietnamese waiting to try the Big Macs and Chicken McNuggets at glober burger first restaurant in the capital’s Old Quarter, where famous with its street food like pho or banh my for foreign visitors. Since the first time McDonald’s camo to Vietnam in 2014, 16 brands have open but all in Ho Chi Minh City. This newest brand is the very first McDonald’s restaurant outside of southern of Vietnam. Globen fast food company have a warm and sweet weekend open with thousand of hungry customers come to try famous bugger for the first time. Many young Vietnamese who are accustomed to American culture are eager to experience McDonald’s fast food. Some older people, in other hand feel happy because a big American brand of set foot to the heart of the country shows how far U.S.-Vietnam relations have come. Some curious tourists stopped to see what all the fuss was about, perplexed that a brand ubiquitous in the West would draw so much attention. McDonald’s is not the first international F&B company join Vietnamese market. Vietnam has open it door to grow economic in recent years and welcome all investments around the world. Some of famous brand also appear in Vietnam for years are KFC, Bugger King, Domino Pizza and Starbucks. Average income in Vietnam had grown double from last decade to about $2,200 today, and half of population of 93 millions is under 30-years are young people who want to experience new and familiar with Western cultures. This is the main reason to make the fast food industry in Vietnam has seen double-digit growth annually for the past five years, and the country has the highest 2017 growth in Asia-Pacific for fast food chains, according to market research firm Euromonitor International. Cost for a meal at McDonald’s is three time higher than at local places, but young customers seem to be not really care about this. “Young people like to hang out in fast food restaurants as they are seen as a cool and nice place … and these customers also like the taste of the food,” Euromonitor analyst Samuel Huynh told AFP.